With Crayola Fabric Crayons, you simply draw a design on non-glossy paper, then transfer it to synthetic or synthetic blend fabric by ironing the back of the paper. The colors become brilliant as they are set. Polyester requires the use of disperse dyes. Other types of dyes leave the color of polyester almost entirely unchanged. While novices happily charge into dyeing with acid dyes (for wool or nylon) and fiber reactive dyes (for cotton and rayon), often with excellent results, the immersion dyeing of polyester is a different story. However, disperse dye can be used by even young children to make designs on paper, which can then be transferred to polyester fabric, or other synthetics, with a hot iron. The possibilities are endless, using fabric crayons, rubber stamps, painting, and even screen printing. How can I dye a polyester dress? Commonly, people who have never dyed anything before will e-mail me asking how they can dye dresses for their weddings, or their daughters' weddings. Attempting to do this would almost always be a grave error. Immersion dyeing with polyester is not a job for beginners; it is both more difficult and more dangerous than immersion dyeing cotton or wool. Furthermore, most such pre-made dresses are marked "dry clean only", and you simply cannot dye a garment that is not washable. Is there someone who will dye my polyester formal for me? No. It is exceedingly rare to find a service that will custom dye a single garment for you, and nobody anywhere will take the risk of ruining a dry-clean-only garment by dyeing it. If you want a dress in a certain color, buy fabric in that color, or dye yardage of an easily dyeable material such as cotton or silk, and hire a local seamstress to sew it for you. If you have a washable garment, you may be able to find someone who does custom dyeing on my Listing of Custom Dyers page. Do not post your need there; instead, check for someone advertising services there. Most dyers are willing to dye natural fibers only and refuse to consider dyeing polyester garments. The difficulty with polyester dyeing is that it requires a lot of heat to get the dye into the fiber. Boiling water is not hot enough to do the job by itself, so a noxious-smelling carrier chemical must be added, for immersion dyeing, unless newer low-energy disperse dyes are used. Polyester dye actually transfers to the fibers best at very high temperatures, the temperature of a hot iron, or higher. Before you decide to try immersion dyeing polyester, study the directions at ProChem (see below, under "Specific Instructions") to get an idea of how difficult it may be. However, even if you should not attempt to dye your own formal dress, there are many fun projects that are highly suitable to even the least experienced fabric artist. Crayola, the maker of wax crayons for paper, also makes fabric crayons for use on polyester and other synthetics. These crayons consist of disperse dye, and can be found in most fabric or crafts stores, even in discount department stores such as Target or WalMart. You do not draw directly on the fabric; instead, you draw on paper - or have your children draw on paper! - and then iron the resulting pictures onto the fabric. (Be sure that any writing is backwards on the paper, since it will come out reversed on the fabric.) The crayons are not particularly bright on paper, but become vivid when heat-transferred to the fabric. 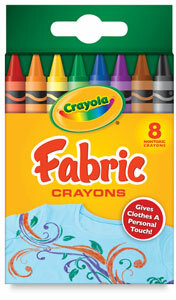 For an example, see my page Iron-on Fabric Crayons for Synthetic Fibers. Note that, like most dye, disperse dye is transparent. This means that you should transfer it only onto white or pale colors of fabric, so that you can see the results. Disperse dye can be applied to paper with rubber stamps, and then ironed on to polyester, just like the crayons. You can use special, large-scale fabric stamps to apply other dyes to fabric, but only disperse dyes allow such fine lines that almost any rubber stamp designed for use on paper will work, if your fabric is smooth enough. Look for a product called "Heat Set Ink" at companies that sell rubber stamping supplies. Caroline Dahl's wonderful book Transforming Fabric gives source information for this material, in addition to many project ideas and beautiful inspiring photographs of works made with disperse dye on polyester. The powdered disperse dye can be mixed into paint to apply directly in any of several techniques. Just as with the Crayola fabric crayons, you can use disperse dye to paint on paper, then iron it on to your fabric. Mix the dye with enough boiling water to dissolve it, then dilute with cool water to the desired strength - trial and error must be your guide here, keeping in mind that you cannot know how intense the final color will be until you actually iron it on, as it is much more beautiful on the cloth than on the paper. See the Batik Oetoro web site and Prochem's instructions for transfer printing (via the links below) for detailed directions. If, like most irons, yours has holes in its face plate, you must be sure to move the iron around constantly during the transfer process, to prevent holes from appearing in your design, and yet you must not allow the paper transfer to move on the fabric, or the image will be blurred. A heat transfer press, such as are used in t-shirt shops, would be more desirable, as it not only lacks holes, but, more importantly, reaches a higher temperature. However, at around a thousand dollars, this is far more of an investment than most individuals are prepared to make. For a more modest sum, consider the Dry Iron, without steam holes, at the Vermont Country Store's website. Here's a very simple project that can be done with disperse dye - simple in concept, that is, but very complex and beautiful in its details. As pictured in Kate Wells' Fabric Dyeing & Printing, artist Sarah Batho applied disperse dye paint to paper (you could equally well color it heavily with Crayola fabric crayons), scattered real bird feathers across her polyester fabric, then ironed the dye right over the feathers. The feathers prevented the dye from reaching the fabric, leaving a lovely delicate design of white feathers on an intense blue background. Tie-dyeing polyester is not a project for the novice tie-dyer. Only a real expert should even consider it. If you are just starting out, please try dyeing with fiber reactive dyes on cotton, rayon, or silk, first. Traditional single-color tie-dye can be done by tying the dry garment, then dropping it into a hot immersion bath. See the links for directions for immersion dyeing, below. You can get interesting results by tying and dyeing once, washing out, and retying in a different pattern before dropping in another boiling dye bath of a different color. For example, a first dyeing of turquoise followed by another dyeing with fuschia will produce a purple garment with patterns of turquoise and fuschia where the ties prevented full penetration of one of the dyes. Interesting shiborit-like textures result from boiling tied polyester. ProChem's instructions for direct application on polyester (see link under "Specific Instructions", below) can be used for a more challenging approach that will give results similar to the currently popular cotton tie-dye techniques. After applying a paint that contains special thickener paste, citric acid, dye carrier, and disperse dye, steam or pressure steam for 30 to 60 minutes to set the dye in the fabric. As dyeing polyester is far less popular among artists and craftspersons than the dyeing of cotton or wool, there are fewer providers of disperse dyes for home or studio use. Among them are, in the US, PRO Chemical and Dye (PROchem), and Aljo Dyes, Batik Oetoro and KraftKolour in Australia, and Kemtex and Rainbow Silks in the UK. 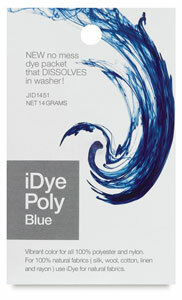 Dye suppliers that sell Jacquard Products may carry their brand of disperse dye, iDye Poly. Some suppliers label their disperse dyes as "transfer dyes". For contact information, see Sources for Dyeing Supplies. Batik Oetoro gives instructions for transfer printing and immersion dyeing with disperse dyes, which they sell under the brand name of Polysol Dyes. Polyester fibers are sold under various names, including the following: Crimplene, Dacron, Enkalen, Lavsan, Mylar, Tergal, Terlenka, Terylene, Trevira, Polarfleece, and Polartec. Polyester is, chemically, a fiber made of poly(ethylene terephthalate), and can be made from recycled plastic bottles. Plastics marked with the recycle logo containing a number 2 are HDPE (high density polyethylene), plastics marked with the recycle logo containing a number 4 are LDPE (low density polyethylene), and plastics marked with the recycle logo containing a number 1 are PETE (polyethylene terephthalate - e.g., Dacron, Fortrel, Mylar). A new polyester, called Corterra®, was developed in the 1990s by Shell and licensed by KoSa; it is composed of polytrimethylene terephthalate, and is dyed with disperse dyes like other polyesters. Polypropylene should not be dyed at home or in the studio. It is popular for hiking socks and long undergarments. Names under which it is sold include Meraklon, Monolene, Polyfilene, Prolene, and Ulstron. Products marked with the recycle logo containing a number 5 are polypropylene. Polyvinyl chloride. Products marked with the recycle logo containing a number 3 are PVC. Acrylic is sold under names such as Orlon, Courtelle, Dralon, Leacryl, and Nitron. It is composed of poly(propenonitrile)(polyacrylonitrile) with small amounts of a comonomer. Acrylic can be dyed to pale or medium shades with disperse dye. Modacrylic is sold under names such as BHS, Creslon, PAN, and Teklan, and also, according to Ingamells, as Lycra (which must have been a misprint). Modacrylic fibers are between 35% and 85% acrylonitrile, and are made from resins that are copolymers (combinations) of acrylonitrile and other materials such as vinyl chloride, vinylidene chloride or vinyl bromide. Modacrylic can probably be dyed just like acrylic. Lycra, a spandex fiber produced by Dupont, is elastic spun polyurethane, a plastic which is also used to construct upholstery foams. It must not be subjected to high heat, and is thus not appropriate for use with disperse dye. Most lycra garments contain a high percentage of cotton, which can be dyed with cool water fiber-reactive dye; often, the undyed lycra does not even show on the outside of the garment. Ingeo® is a "natural" polylactate fiber derived from corn. It can be dyed only with disperse dyes, like polyester, but it shows lower washfastness with these dyes than does polyester. Source for names (except for Ingeo): Wilfred Ingamells, Colour for Textiles: A User's Handbook, The Society of Dyers and Colourists, 1993, ISBN 0 901956 56 2. While the immersion dyeing with disperse dyes is difficult and somewhat dangerous, due to the temperatures required and the carrier chemicals, the disperse dye itself is considered non-toxic. Even children can engage in these crafts, if an adult is available to do the ironing step for them. All powdered dyes are dangerous to breathe, like most powdered substances. Even many foods can be quite damaging when inhaled in powdered form. Avoid breathing dye powder. Wear a dust mask while measuring any dye powder, and wipe up spilled dye, of any dye class, as it may turn back into powder when it dries. Since no disperse dyes (and few other textile dyes) have been shown by safety testing to be harmless when consumed by humans or animals, the cooking pot used to boil the dye with the fiber should not be reused for food preparation. Kate Wells' Fabric Dyeing and Printing , from Interweave Press, 1997, shows photographs of the process of transfer printing on polyester with disperse dyes. Illustrations and instructions include simple transfer printing, printing with leaves that have been coated with disperse dye, simple resists of disperse dye transfer, and pressure steaming after direct application. Ann Milner's Ashford Book of Dyeing , from Shoal Bay Press, 1998, includes a three-page chapter with detailed clear recipes for using disperse dyes in a dye bath, by direct application, and by heat transfer. Holly Brackmann's The Surface Designer's Handbook: Dyeing, Printing, Painting, and Creating Resists on Fabric , from Interweave Press, 2006, is the best book I've seen on disperse dyes for hand dyers, with an eight-page chapter on them. She includes separate recipes for disperse immersion dyeing of nylon, acetate and acrylic; disperse immersion dyeing of polyester; direct application of disperse dyes on nylon, rayon acetate, and polyester; and transfer printing, plus a number of variations for transfer printing, including combining transfer printing and permanently pleating polyester in a single step. A.K.R. Choudhury's far more technical Textile Preparation And Dyeing includes far more information on different properties of disperse dyes on different textiles, and of the many problems involved in their preparation and use, from the perspective of the textile industry.